How do I know if a diamond is genuine? You will not. You need to be an expert and use specialized equipment to make sure a diamond is real. Do not trust ideas like scratching a beer bottle (it may damage the diamond too), thermal conductivity, looking through, comparing weight, etc. If the diamond is accompanied by a certificate, you will know it is real and if it is treated artificially or not. Which shape gives me the greatest value for my money? Round brilliant diamond has the most brilliance, and the most popular. Fancy diamonds look more elegant in larger sizes. Also, they tend to look larger than they are by virtue of their shape. 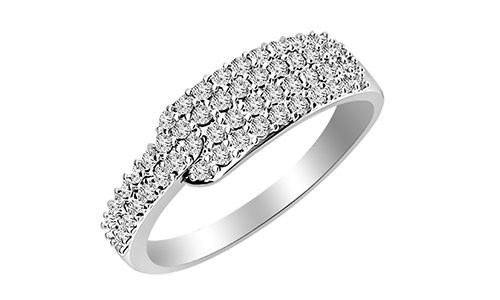 The choice of shape is also governed by the shape of the hand and Diamond Colour and Diamond Clarity. Round brilliant diamond hides defects and yellow tints the best. What is the structure of a diamond? Facet: any of the flat "sides" of the diamond. Girdle: The typically frosty white ring at the widest part. Fire: The quality of the diamond that breaks reflected light into a colorful array. Brilliance: The quality of the diamond that reflects light without changing it (also called sparkle). Fluorescence: The characteristic of some diamonds to fluoresce certain colours under some light. Natural: Usually found on the girdle. A small section was on the side of the raw diamond. It appears as a slightly rough flat spot on the girdle. Feather: A “crack” in a diamond, appears as a white feather within the stone. OK; now that I know the terminology, what are the more important factors? The first six terms describe the geometry of the diamond. Fire and sparkle are variable characteristics that are determined by the proportions of the diamond. Modifying proportions to increase one may decrease the other! Look for a good balance of fire and sparkle. Fluorescence occurs naturally and synthetically. It is not common, so jewellers will try to command a higher price. In general, it does not change the value of the stone, but severe fluorescence gives stones an oily appearance in sunlight, and decreases its value. Naturals if not severe are not bad. Small feathers are common. Any crack that extends more than 1/3 of the way through the stone may cause structural problems. How many facets does a diamond have? A. On a brilliant full-cut stone, there are 58 facets; 32 facets plus the table above the girdle and 24 facets plus the culet below the girdle. Some stones with only 18 facets are referred to as "single cuts". What are the "four C's" relating to diamond quality? The four C's are Carat (weight), Colour, Clarity and Cut of the stone. The weight of the stone, referred to in points in case of small stones.1 carat is 1/5 of a gram or 200 milligrams.There are 100 points to a carat. A 75 point stone is .75 carat. "Carats" represent the weight and not the physical size of the stone. Example, 1 carat diamond is physically larger than a 1 carat ruby since ruby is denser than diamond. Colour is usually undesirable in diamonds. Typically ratings will be alphabetical with the earlier letters of the alphabet having less colour. AGS has a similar 0-10 scale. D, E and F - "Colourless"
G, H, I & J - "near colourless"
K, L and M - faint yellow or "top silver"
Z+ - grades are considered "fancy yellow" Most stones you will find will be in the E-F to the J-K range. Internally flawless (and flawless) group: FL-IF The highest clarity grade given. “The diamond in question will be without imperfections visible with x10 magnification. Some blemishes may be permitted externally bringing the stone to a clarity of “IF” or Internally Flawless”. Very Very slightly included group: VVS1 and VVs2 The VVS group is divided into two, VVS1 and VVS2: “The VVS inclusion in question will be very hard to detect, even for an experienced examiner using x10 power magnification”. VVS1: These diamonds are very close to being Internally flawless. Only a minute imperfection, that is almost impossible to detect under magnification, lowers it to a VVS1 grade. VVS2: Great buys for people who would like a flawless diamond but would rather not pay the high price. It is very hard for a novice to see the imperfection in this diamond even under magnification. Very slight included group: VS1 and VS2 The definition of this group is as follows: “The VS inclusion in question will be hard to detect, even for an experienced examiner using x10 power magnification”. VS1: Have imperfections that are very hard to detect with a jewelers loupe. These diamonds are much cheaper than the IF-VVS2 range and are very popular. VS2: Considered to be without significant inclusions. They are the most popular in the VS2-IF range. A beginner would find it very hard to detect the imperfection with the aid of a jewelers loupe. The majority of engagement diamonds bought today are of the SI range: “Inclusions and imperfections in this group may be visible easily with the aid of x10 magnification”. SI3, a relatively new grade added by some laboratories to bridge the very wide gap between SI2 and I1 (imperfect). SI1: Can be seen easily with x10 magnification. Cannot be viewed with the naked eye. This is the most popular clarity today. These diamonds are 100% eye clean, so for all practical purposes when in a ring they will look to absolutely clean with no imperfections. SI2: Can be seen easily with x10 magnification. In some cases the SI2 can be viewed with the naked eye - especially if the SI2 is in the center of the diamond. A SI2 off to the side of the diamond is harder (if not impossible) to see with the naked eye. If the SI2 is up against the side of the diamond it can be covered with the prongs of the jewelry, leaving you with a "clean" diamond for a lot less than a SI1. SI3: Can be seen very easily with x10 magnification. In most cases (stones above 3/4 of a carat) can be viewed with the naked eye. This grade is not recognized by the GIA and thus we do not sell them. Other less strict labs do use this grade. I1, I2 and I3 The imperfect group is the final group on the diamond scale: "Flaws in diamonds from this category are visible with the naked eye". I1: Diamonds in the I1 range are still pleasing to the eye. The imperfection is not large enough to take away from the general brilliance of the stone. In many cases the I1 impurity is off to the side of the diamond and can be covered up quite nicely by the rings prongs thus leaving you with a "clean" diamond for a very reasonable price. This is the lowest clarity grade we sell. I2: Diamonds in the I2 range have large imperfections that in some cases cover a substantial portion of the stone. They are also easily visible to the naked eye. We do not sell I2 quality diamonds. I3: If you're shopping for "rejection grade" diamonds, this is the group for you. These diamonds are so heavily included that they have essentially lost any appeal, or "life". We do not sell I3 quality diamonds. Inclusions are imperfections within the stone. Inclusions range from bits of carbon (black spots) to slight cracks (called "feathers") within the stone. VVS1 to SI2 represent inclusions that are not visible to the naked eye. All diamonds are cut. The resultant dimensions of the cut stones vary. All dimensions are given as a percentage of the width at the girdle. There are a few accepted ideal cuts, which have all of the proportions within a few percentage points of an optimum mathematical model. This optimum model returns maximum light through the top of the stone, resulting in maximum brilliance. What is the most important C in the choice of a diamond? Colour or Clarity? The most desirable colour of the diamond is white. The Colour scale ranges from D to Z, where D is the whitest of the white and hence most expensive. However, colours between E to H are regarded as very white, and you cannot make out the difference in colour once a diamond is set. However, diamond colour becomes more obvious as in larger size diamonds, or in shapes other than the round brilliant. For instance, the Asscher and the emerald cuts are more see-through with large facets, and require a higher colour and clarity than other shapes. Colour is something that can be discerned with the naked eye with practice (such as looking at the engagement ring everyday. Hence, it is advisable to buy as white a diamond as you can afford in your carat range, in an eye clean or better clarity. If a diamond has slight blue fluorescence, it could render your H or J colour whiter. Also, if the stone is very well cut, it makes both the clarity and colour look better. Clarity is not a factor you can judge only by looking at the diamond under magnification. Step cut diamond shapes like emerald and Asscher cuts require a higher quality of colour and clarity as they have large see-through facets which make it easy to see any imperfections. In India, Colour takes precedence over Cut. The order or priority for most Indian customers if Colour -> Cut -> Clarity. In Southern India, where most customers are particular about dosham (defects), clarity is the most important consideration in selecting a diamond. Here, the order of priority is Clarity -> Colour -> Cut. However, if a customer asks for a recommendation, Akshar Jewel always advices them to prioritize Cut and Colour over Clarity. This is because diamonds up to S1 grade are "eye clean". The inclusions are visible only under the loupe to a trained eye, and does not make any difference to the way the diamond looks. Is the shape the same as the cut? No. They are different. The real "cut" as it is referred to deals with the quality of the final product in terms of its maximizing the return of light. Four shapes of diamonds are the most popular: Round (or brilliant), Emerald, Marquis and Pear. The "Ideal Cut" is a cut based on a specific set of proportions for a round brilliant diamond, proposed by gem cutter Marcel Tolkowsky in 1919. While Tolkowsky's original theories presented only one particular combination of proportions for creating the best balance of brilliance and dispersion, today the American Gemological Society recognizes any diamond falling within a narrow range of proportions and finish quality as being an "Ideal Cut" (also called an "AGS 0" or "AGS triple zero").Essentially, the larger the table, the greater the brilliance at the expense of fire. A generally termed ideal cut will have a table percentage between 53% and 57% and a depth or height of 58% to 60%. Expect to pay 15%-20% more for an ideal cut stone. Avoid stones with table percentages above 70% or depths over 64% or under 57%. I know that most rings have inclusions; what is OK and what is not? Is there any way to identify a poor cut? A white circle resembling a donut in the face-up view of a diamond. It occurs when the pavilion is too shallow and the girdle is reflected out. Obvious dark spots / centres when viewed face-up. These indicate that the pavilion was cut too deep. Extremely thick girdles reduce the brilliance and make the stone look small for its weight. A girdle of uneven thickness (for reasons other than geometry) around the stone. One good way to see how well a stone is cut is to view it straight down on the table. The table and the four corners form a "square shape". On well-cut stones, the sides of the square will bow in "slightly". Sides that bow out are not ideal. A slight inward bowing may be tough to detect, so consider a seemingly perfect square to be a decent cut. Severely bowed in squares are also undesirable. What is the shape of the diamond used in engagement rings? What is the best shape of diamond for an engagement ring? 6. Colour and clarity of diamond (round brilliant cut hides defects and yellow tints best). Why do they seem to follow this pattern? Small round diamonds are more common, easier to cut, and easier to sell than fancies. About 75 per cent of the diamonds sold in the world are round brilliant cut diamonds! For larger stones, rounds are in higher demand and the supply is limited. The only exception is the large marquis, which is can cost as much as or more than the round brilliant. Should I get my diamond set in platinum or gold? A platinum setting will usually work best with a diamond, though it is usually a little more expensive. Because platinum is a stronger metal, your diamond will be safer under a platinum setting. The cost of platinum is about four times that of gold, but People think in comparison to the price of the ring, the difference is not much. However, if you have a very clean, good diamond, then the platinum can make it stand out. Yet, in the same situation, if you had a gold setting, the gold might make the diamond look more yellow than it really is, which is not desirable. If you are looking at grades D-G and IF - VVS2, platinum may be a better choice. I'm getting my diamond inspected/remounted/etc. How can I be sure they don't switch the stone on me? Know where the inclusions are on your stone. Inclusions are the signature of diamond, which are the identifying marks. You can have it certified by the GIA for a fee. They will document the exact location of all identifying inclusions along with colour and carat. This is the exact and easiest way to identify your own diamond. You can re certify your diamond to compare it with the old certificate you have. Certification is not very expensive. What should I look for in the workmanship of the stone? Make sure it is round. Make sure the culet is not chipped or broken. The girdle should not be too thick or too thin. The girdle should be straight, not wavy from the sides. The facets of the crown align with the facets of the pavilion; any misalignment will show itself in the girdle. With a loupe of a scope, look closely at the girdle. Stones that are cut in a hurry will have small cracks that extend into the stone, making it look fuzzy or "bearded". Don't confuse this with the natural frosty colour of the girdle. If the symmetry of the stone is off, or if it is damaged, extra facets may be added. Be sure the table is parallel to the girdle and the culet (as seen through the table) is on-centre and undamaged. Which are the most popular fancy colours in diamonds? Fancy colored diamonds are called Z+ diamonds. These Z+ diamonds are the rarest hence the most expensive Z+ is more expensive than D s. Yellow and pink diamonds are the most commonly sought after fancy colours, and most likely will continue to be for years to come. Of late, there has been an increased demand for orange, blue, and green coloured diamonds. As they are rare in nature, supplies are limited, and demand can shift price. How are colour diamond prices determined? What else should I know about colour diamond prices? Clarity, colour distribution and cut together determine the cost of a yellow diamond. Diamonds less than 0.80 carat can cost 10%-20% less. Exceptionally well cut stones and stones with a VVS or IF clarity can cost 10%-20% more. Secondary colours, such as brownish yellow, are less expensive. Should we judge the clarity of a fancy colour diamond the same way we do the clarity of a white diamond? In a white diamond, clarity can make or break the stone, and VS clarity is usually ideal. For fancy colour diamonds, clarity is not the most important factor. A fancy colour diamond that is graded SI is still what is known as "eye clean," meaning that inclusions cannot be seen with the untrained, naked eye. 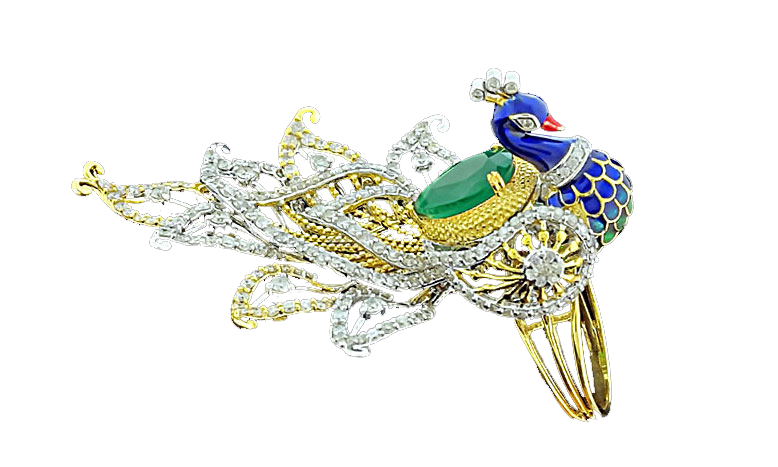 Additionally, small pinpoints or feathers do not usually affect fancy colours due to the deeper colouring of the diamond. Fancy diamonds of VS or better clarity are more uncommon in nature and therefore command a greater price. Tip: If you cannot easily find inclusions under a 10 times magnification you should become suspicious; most likely it is not a real diamond. However, be aware of the fact that some gas bubbles in cubic zirconium may appear like inclusions if you do not look carefully. Do colour undertones affect the diamond's worth? The predominant hue is always expressed as a noun, such as "pink." Any secondary colors will precede the primary hue and are usually expressed with an "ish" at the end, such as purplish pink. This means that the primary hue of the diamond is pink with some hints of purple throughout. If the grade is stated as two nouns—like "brown pink," it means the two colors are virtually even throughout the diamond. What type of inclusions do you see most in colour diamonds? In coloured diamonds, the inclusions are often crystals that exhibit much the same colour as the diamonds. To the untrained eye, these crystals blend right in with a diamond's colour and can create the appearance of more brilliance. Are "champagne pink" diamonds desirable? Champagne diamonds with a secondary pink colour are popular. When faced up, these stones display light to bold flashes of pink in their fire. Champagne diamonds are not as expensive as white diamonds. They are available in a sparkling range of champagne tones, from light to dark champagne and fancy cognac. What is the Bow-tie effect? The bow tie effect, visible to the naked eye, is often observed in marquise, oval, pear and some heart-shaped diamonds. The bow tie looks like two triangular dark shapes joined at a point in the centre of the stone. It is caused by variations in the pavilion facet angles that are longer than wider. If prominent, it is considered a negative factor. In a well-cut diamond its appearance should be minimal or absent and certainly not a distraction. Cubic Zirconia stones are a man-made diamond stimulants with optical characteristics very close to natural diamonds. On the mohs scale of 1-10 for hardness, a CZ is 8.5 - 8.9, while a diamond is 10. Sand or dirt will not scratch a CZ or a diamond, but CZs and diamonds will both scratch glass. A CZ weighs more than a diamond, and this is a principal way to tell them apart. Real diamonds have been created naturally through intense levels of heat and pressure deep within the ground. All natural diamonds are thought to be between 70 million and 3 billion years old. They are mined, cut and polished by highly skilled craftsmen, and are not otherwise tampered with. Synthetic or 'cultured' diamonds are created in the laboratory. All synthetic or 'cultured' diamonds must legally be declared as such. 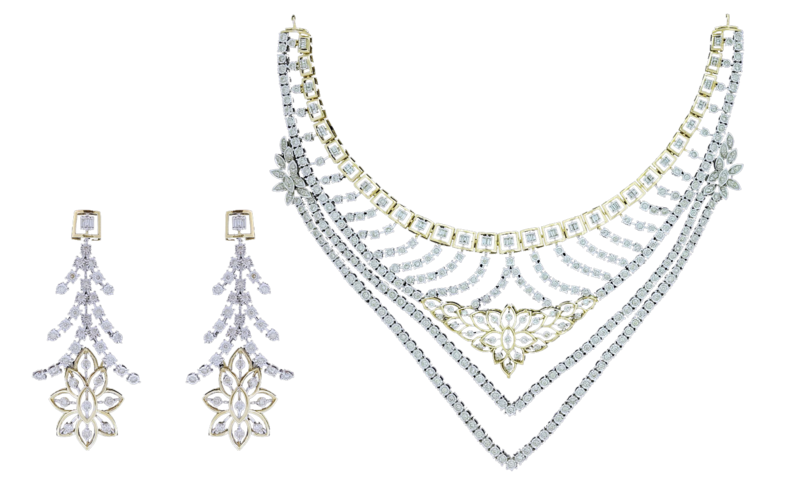 Akshar Jewel offers only are real and natural diamonds. All diamonds used in our 'Create Your Diamond Ring' items are accompanied by their original and unique diamond certificate. Certification for items in our 'Diamond Jewellery Collection' depends on the size and quantity of the diamonds contained in the item do, of course, assure that all our diamonds are real, natural and "conflict-free". Is it possible to have the certificate number 'engraved' onto the diamond? Each GIA certified diamond of less than one carat in size has its unique certificate number microscopically laser inscribed into its girdle, meaning that there can never be any doubt that the diamond and certificate are one of the same. 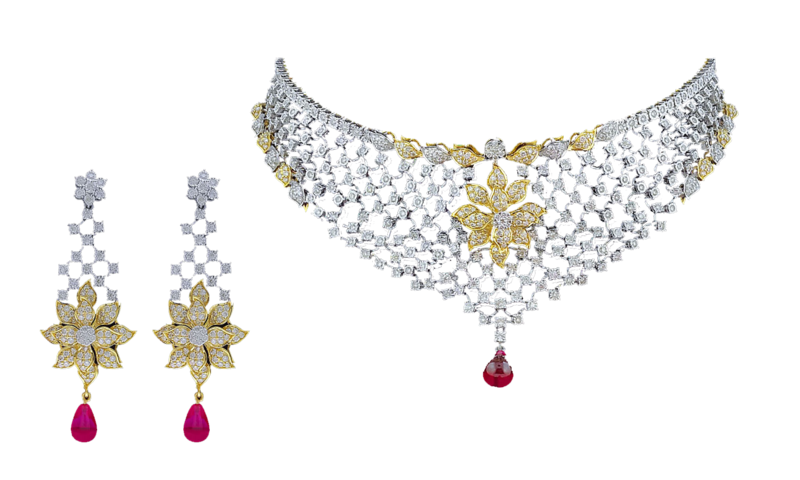 Akshar Jewel also offers this service on other certified diamonds as well at the point of valuation. It is not possible to see this inscription with the naked eye, and extremely difficult to see even with a 10x magnifying loupe. How does the HRD certificate compare to GIA certificate? GIA is the oldest lab and so has become the most well-recognised and reputed, especially in the United States. On the other hand, HRD is well-regarded by the diamond community in Europe. HRD and GIA differ ever so slightly in systems of grading. Both strive to conform to their own system and overall, both do good and comparable jobs. You should to be able to buy a diamond with a high degree of confidence with either lab's report. How do I choose the largest diamond within my budget? Use the search option on Akshar Jewel that searches for loose diamonds and fill in your preferred budget details. You will get a range of stones that you can sort by size. Alternately, you can first enter the size of diamond you were considering (in case you do not want to buy anything less than a carat, for instance).You can choose your diamonds from Akshar Jewel Colossal collection if the size does matter to you. Sort the search results to see which diamond in this size suits your budget. I am looking for diamonds without black inclusions. How do I identify those? Since diamonds are a natural substance, most come with some small internal flaws or inclusions that are like their defining characteristics, similar to birth marks. Completely flawless diamonds are extremely rare, and usually found only with collectors. For a good idea of the inclusions in a diamond, examine its certificate for a description of these. You need to have an idea of how the clarity of a diamond is measured, to understand the relative impact of black inclusions. For instance, diamond inclusions can be characterized as Slight, Very Very slight etc. Visit the section on diamond clarity, for a better understanding of this. Is it important that I buy a diamond that is accompanied by a certificate? Yes. Buying with a certificate from a recognized authority such as the AGS, GIA or IGI means that your diamond has the credentials to be recognized worldwide as a valuable item. Resale values of diamonds drop drastically when unaccompanied by a certificate. Also, a certificate makes you sure about the authenticity and purity of your diamond.